M27, the Dumbbell Nebula is a planetary nebula - a nebula created as a star is reaching it's final stages. As the star starts to burn out, it blows off shells of gas. As this gas expands, it is heated by the star and shines. We see this expanding gas cloud as a planetary nebula. 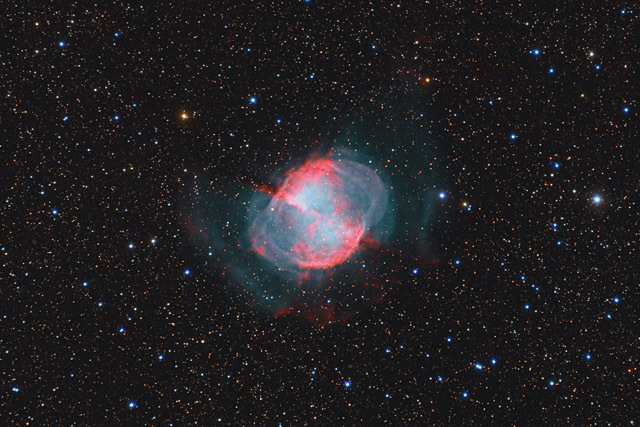 M27 is an easy object to view in a telescope, as it shines brightly at magnitude 7.5 and is relatively large at about 8' wide (about 1/4 of the Moon's apparent diameter). However, this image adds some narrowband Ha and OIII data and shows the larger and fainter extended nebulosity that reaches out twice as far. In this image, North is Down. This image is cropped to 50% of the original full frame. SQM Reading Bortle 4 on all 4 nights, typically 21.40 to 21.60. Some narrowband data captured with Moon up. Software Used Images Plus 6.0 for camera control, Images Plus 6.5 for calibration, stacking, ArcSinH stretching, star size reduction, edge masking, and masked stretching. Photoshop CS5 used for levels and curves, lab color, saturation adjustments, selective color, match color, screen mask invert, high pass filter, narrowband colorizing and stack blending. Gradient Xterminator for gradient removal. Carboni Tools for additional noise reduction and smoothing. HLVG for additional color correction. Registar 64 for subexposure alignment. Focus Magic for focus restoration. Notes This is my first image with my new CCD camera and I decided it was best to try a comparatively easy and bright target. My big goal with this image was to capture a great deal of narrowband data so that I could bring out the fainter outer nebulosity, particularly the extended OIII. Instead of doing a bi-color version of this image (using just OIII and Ha data), I decided to add the color LRGB in order to have natural looking star colors. I also used a bit of the LRGB data to blend in the bright core of the nebula and give it what I hoped would be a more natural look. Overall, I'm very happy with this image and quite excited about the potential it shows for the new camera. Although I captured it at only 600mm of focal length, the stars ended up quite tight and I was able to bring out some nice details as well. For this reason, it gives me high hopes that this setup will perform reasonably well with smaller and more detailed targets.